I haven't made a post in about a week and a half, and that is because nothing exciting has been going on. Back to school next week as a junior in college. I'm taking enough technology classes to drive anyone insane, and I'll have one or maybe even two jobs, so I'll be busy. Busy is better than bored, that's for sure. In other news, I've been playing with Adobe Photoshop lately. 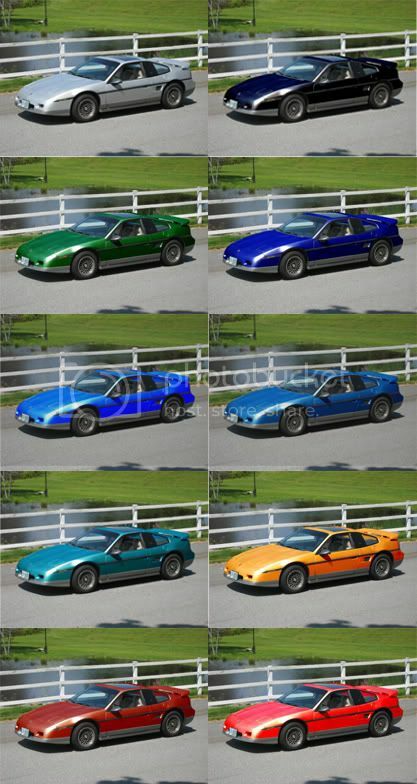 My most recent project was changing the body color of my 1987 Pontiac Fiero GT to various colors. Although not a complicated process, its rather tedious, but in the end the results are completely worth it. Many of these colors actually look like they were original. Here's a little collage of some of them.